At mm racing, former professional footballer Markus Münch and public trainerin Angieska Klus have built a committed and well-qualified team. Since moving to Frankfurt at the beginning of 2012 mm racing iprovides you with excellent training conditions. 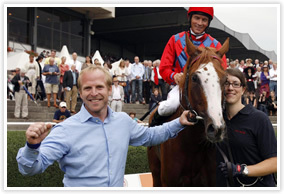 The yard is centrally located and is also quite close to France so there are good opportunities to attend races abroad..
mm racing provides a range of services to its racehorse owners and their thoroughbreds which also includes pre-training, sales preparation and consignment.